Averi had the most ridiculous tantrum Sunday night. We were swimming and when it was time to get out she got very upset that I was not willing to stop what I was doing and stand by the steps with the towel open so she could walk straight into it. Her crying lasted an hour. She thought she was the Diva of the house. Please and as if. I run this house. 🙂 So obviously Averi broke first. And then I get to punish her. This time it was no treats and loss of her iPad for a week. And I did say yes. Mainly because we had a lot of berries and I wanted to use some before they went bad. So I found a recipe on Inquiring Chef for Dark Chocolate, Raspberry and Oat Bars. They looked fantastic. I love chocolate and fruit together. Of course, I had to make substitutions based on what I had. 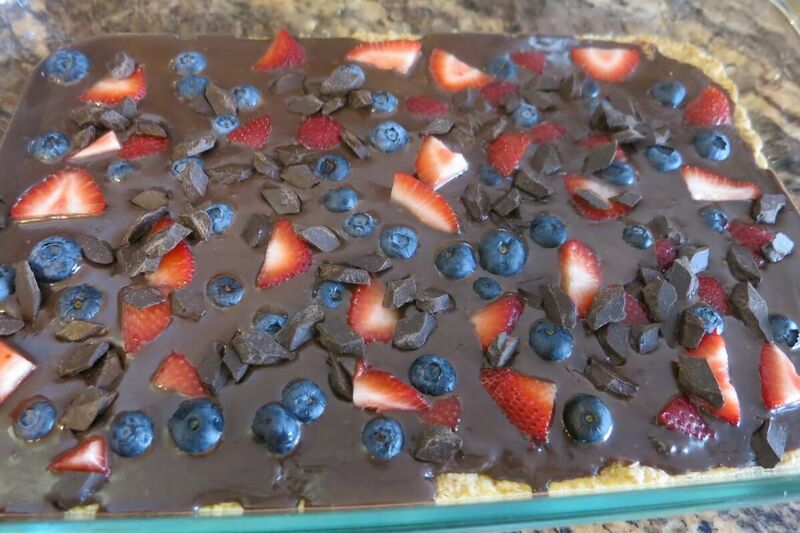 So instead of dark chocolate I used semi-sweet chocolate chunks, and a mixture of blueberries and strawberries instead of raspberries. The biggest change I made involved the sweetened condensed milk the recipe called for. Because I didn’t have any. But what I did have was a product that Michael had brought back from his last trip to Russia. He said they used it in coffee. I tried googling the name to see exactly what it was but my keyboard doesn’t make that inverted V. Or if it does, I don’t know how. 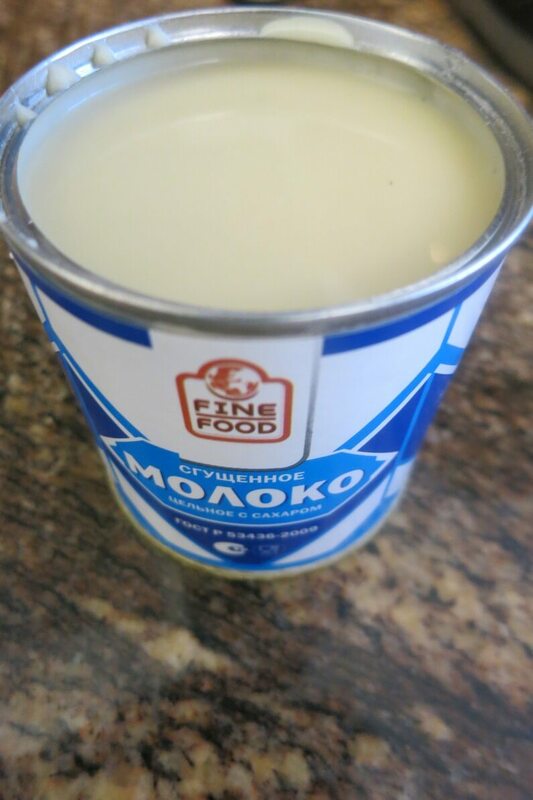 But when I opened it the color and consistency seemed pretty similar to condensed milk, so I went with it. Luckily, it worked out. The bars were delicious. 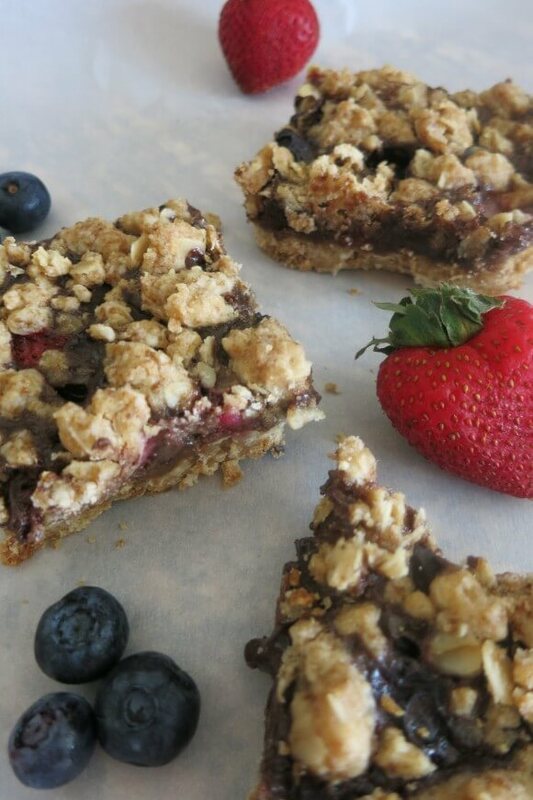 Crumbly topping from the oats, smooth chocolate layer mixed with chunks of chocolate, and then the fruit. As much as I love chocolate, the fruit really was the star. 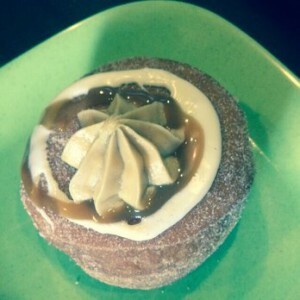 It provided great bursts of flavor and a lightness that provided a nice contrast to the chocolate. 8 oz semi sweet chocolate chunks, divided. Mix oats, flour, brown sugar, baking soda and salt in a small bowl. Add melted butter, and combine until all ingredients are wet and the mixture is crumbly. Set aside two cups of the oats mixture and press the remainder into a greased, 9x9 glass baking dish. Bake for 10 minutes. Remove from oven and let cool. Melt 4 oz of the chocolate. Mix with the sweetened, condensed milk until combined. 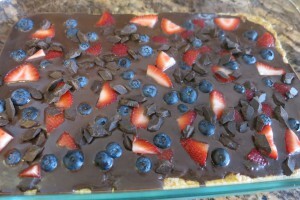 Place fruit and remaining chocolate chunks over the chocolate layer. Sprinkle remaining two cups of oat mix over the fruit and chocolate. Let cool completely and then refrigerate till the chocolate layer has set. Cut into bars and enjoy!